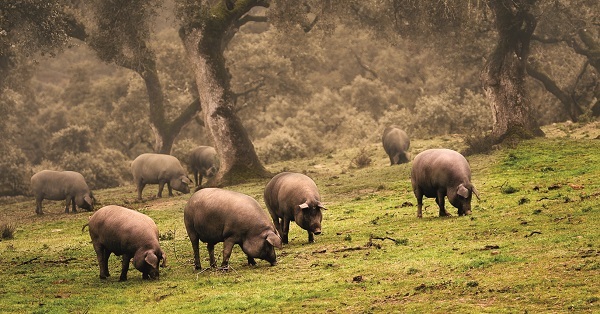 Curiosities: Guijuelo ham as "Designation of Origin"
Designation of Origin Guijuelo hams and shoulders are those who same from Iberian breed pigs or authorized crossbreeding by the National Current Legislation in Force. This Protected Designation of Origin certifies both origin and quality of Ibérico hams and shoulders, which has been free-fattened and ranged in pastures and made in natural cellars placed in Guijuelo (Salamanca). After the breeding and curying process of D.O. Guijuelo hams and shoulders, they should have a set of physical and organoleptic features which are very specific. The external shape is long and stylized, preserving the original hoof's piece. About the outside colour, the ham's skin (also known as mycosis flora) may be white, bluish gray, deep gray or purple, formed during the maturation process. The colour of the meet in the surface cut is pink or deep red of a shiny aspect, with streaks of fat and infiltrated fat on the muscle mass. The meat is consistent in the muscle mass and slightly oily in the fat (or known as adipose tissue). The oiliness of fat may vary depending on the quantity of acorns the pigs have eaten during the fattening cycle. Fat is shiny, white-yellow colour and of a nice taste. About the weight, minimum weight for 100% ibérico hams should be 5.75 kilos and 3.7 kilos for shoulders of the same kind. Pieces coming from 75% ibérico hams, minimum weight will be 7 kilos and 4 kilos for shoulders of the same kind. Meat's flavour is soft, sweet or not too salty. Meat is fibrous and it has a nice taste. Every Designation of Origin is distributed in three zones depending on its aim: Breeding area, production area and curing area. Breeding or fattening area is mainly conformed by pastures. Its climate and its situation in Spain, makes it basic to obtain DO Guijuelo hams and shoulders. Those pigs have been free-ranged. Production area of Protected Designation of Origin Guijuelo hams and shoulders is conformed by seventy eight towns, placed in Salamanca. Those towns are placed at southern Salamanca, surrounded by pastures and in the confluence of Sierra de Bejar and Sierra de Francia. The most important town is Guijuelo, which gives name to this DO. Cured and maturation of those pieces is done on Guijuelo thought breeding and production is done in other parts of Spain. Due to the perfect microclimate of Guijuelo for curying processes, there are many companies doing this process. Guijuelo is placed in Meseta Ibérica (Iberian Plateau), 1000 metres over the sea level. 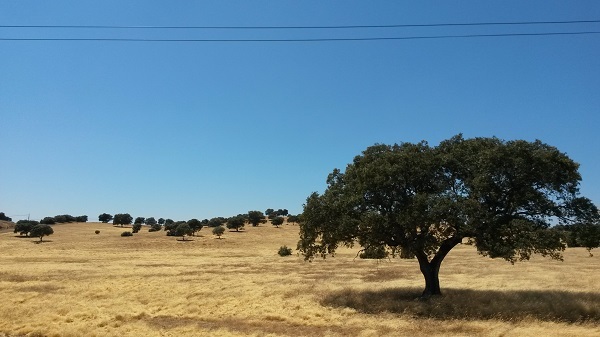 Climate of Guijuelo has cold and dry winters and mild and short summers. The set of geographic and weather characteristics is perfect for hams and shoulders drying and maturation. Designation of Origin Guijuelo’s Regulation Council does numerous controls in order to guarantee quality of D.O. Guijuelo hams and shoulders. 1. Pastures are conformed by cork oaks and shrubs in Mediterranean forests, combined with other spices like graminae and asphodel which should be located in the production area. Those resources are used during montanera cycle (or fattening cycle), in which pigs are feed with resources provided for the current quality standards. 2. Slaughterhouses are located in the production area, accomplishing technical and health basic conditions provided for the Current Legislation in force. 3. Authorised crossbreeding: We will find three sorts of pigs: Bellota 100% Ibérico, Bellota 75% Ibérico and Ibérico Cebo de Campo. Those pigs are 75% ibéricos come from female pigs of Iberian breed and male pigs of Duroc breed, authorised by the Current Legislation in force. - Ibérico de Bellota Ham: Those hams com from pigs have been fed with pastures and acorns. Depending on the pig's iberian breed percentage, the label's colour will be black (in case of being 100% ibérico) or red (in case of being a lower percentage). - Ibérico de Cebo de Campo ham: Those hams com from pigs have been fed with pastures, acorns and authorised feeds. The label's colour is green, independently from the percentage of Iberian breed. To be a part of this Designation of Origin, the minimum percentage of Iberian breed is 75%. * Ibérico de Cebo hams are excluded from this D.O. 6. Minimum distance between feeding and watering points is 100 metres, in order to encourage fat infiltration in the pig's muscle mass. Maximum pigs density per hectare is 15 for Cebo de campo hams and 2 for Bellota hams. 7. Humidity and temperature controls should be done in drying places with outdoor windows and in natural environmental conditions in the production area. 8. Minimum production period for D.O. Guijuelo pieces may vary between 12 and 24 months, 12 months for shoulders and 24 months for hams with no matter the Iberian breed percentage of the pig and its feeding. 9. Minimum slaughtering age may vary according the pig's breeding during its fattening cycle. For Bellota pigs, the minimum slaughtering age is 14 months, while for those Cebo de campo hams is 12 months. 5. Curiosities: Guijuelo ham as "Designation of Origin". Thought the Designation of Origin Guijuelo has been created more than 30 years ago, ibéricos pata negra hams and other meat products production in Guijuelo date long ago. The creation of this Designation of origin was encouraged by the need of controlling the production as it has always been one of the main hams producing areas in Spain. In 1986, the Designation of Origin Guijuelo has been created as a Designation of Origin Regulatory Commission, becoming the first ibérico ham's Protected Designation of Origin created in Spain. The main functions of the Guijuelo Designation of Origin Regulatory Commission are to control certification schemes, from its elaboration to the customer experience in order to avoid fraudulent use of the designation "Guijuelo", as well as the promotion of the Designation of Origin products by informing the customer about the compliance of every requisite. Guijuelo is one of the most recognized Designations of Origin in Spain. Hams and shoulders from Guijuelo (Salamanca) became very popular among clients and professionals. Some of the most famous brands are Joselito, Carrasco, Beher, Arturo Sánches and Julian Martín. Some of those brands have Designation of Origin certified products, while others only have “Guijuelo hams” due to its baste popularity. In Jamonarium we manually select our hams and shoulders, produced by the best ham producer of Guijuelo. The whole elaboration process is strictly controlled, realising different quality controls in order to offer DO Guijuelo high quality hams. We monitore quality assurance process until the final customer experience, supervising and controlling each detail to offer the real Guijuelo ham pata negra.